Welcome to Stop 10 & Chapter 10 of the Consequences Audio Tour! If you’re in a hurry to listen to Chapter 10: DREAMING OF SILENCE, run to THE READING CAT RIGHT NOW! Me: Run run to THE READING CAT to find out! If you have a few minutes… let me introduce you to The Reading Cat. Also, she’s a Montrealer. So you know that means I adore her pretty much automatically. 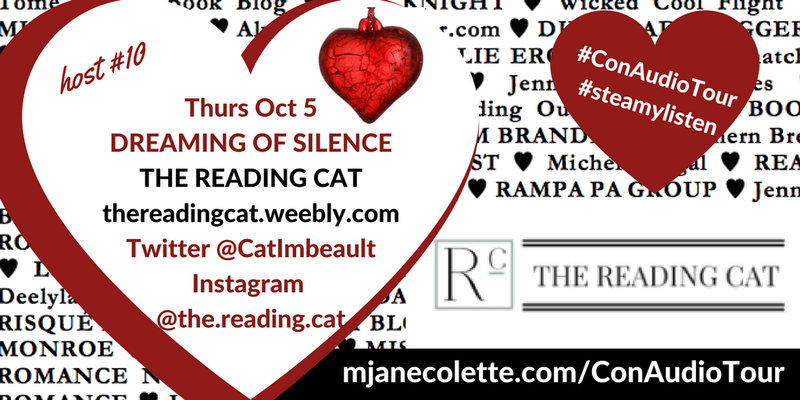 I was so thrilled Cat (The Reading Cat’s real name really is Cat 😉 ) accepted my invitation to be part of the Consequences Audio Tour, and I hope she and her readers enjoy the DREAMING OF SILENCE chapter that The Reading Cat is hosting. To get a taste of Cat’s “completely honest book reviews,” cover reveals, and release blitzes,” connect with The Reading Cat on Twitter, Instagram & GoodReads. And you–get thee to her blog to listen to Chapter 10: DREAMING OF SILENCE.